Have we always "sworn like sailors"? Has creative cursing developed because we can't just slug people when they make us angry? And if such verbal aggression is universal, why is it that some languages (Japanese, for instance) supposedly do not contain any nasty words? Throughout the twentieth century there seems to have been a dramatic escalation in the use and acceptance of offensive language in English, both verbally and in print. Today it seems almost commonplace to hear the "f" word in casual conversation, and even on television. Just how have we become such a bunch of cursers and what does it tell us about our language and ourselves? 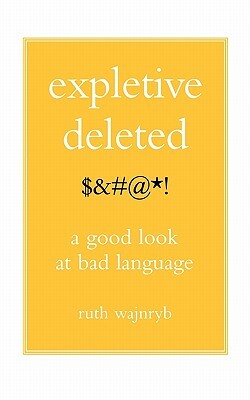 In "Expletive Deleted, " linguist Ruth Wajnryb offers an entertaining yet thoroughly researched, lighthearted look at this development, seeking to reveal the etymologies of various terms and discover how what was once considered unfit-for-company argot has become standard fare. Wajnryb steps outside the confines of English in her search for answers, exploring whether offensive words in English are mirrored in other languages and examining cultural differences in the usage of dirty words. For instance, why is it that in some languages you can get away with intimating that a person and his camel are more than just good friends, while pouring scorn on a mother's morals guarantees you a seat on the next flight out? An amusing and idiosyncratic look at the power of words to shock, offend, insult, amuse, exaggerate, let off steam, establish relationships, and communicate deep-felt emotions, "Expletive Deleted" is a must-read for anyone who loves language -- or has ever stubbed a toe.